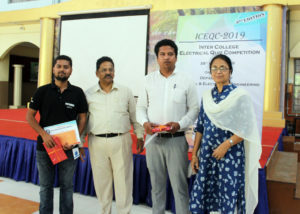 The third edition of the annual Inter College Electrical Quiz Competition (ICEQC-2019) was organized by the Department of Electrical and Electronics Engineering (EEE), on 28 March 2019 at Azara Campus. 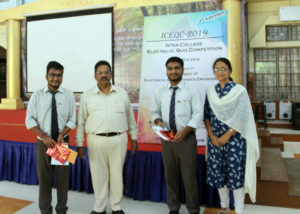 The main objective of the event was to popularize Electrical and Electronics Engineering among the students and to motivate them towards safe practices in this domain of engineering. 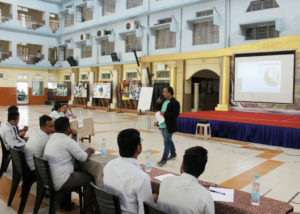 Twenty-two teams from different engineering colleges and universities across northeast India participated in the competition. After a written test, six teams were selected for the final round, and were named after pioneers of electrical engineering, viz., Kirchhoff, Tesla, Faraday, Maxwell, Henry and Edison. Mr. Jesif Ahmed, Asst. Professor (Senior) was the Quizmaster. 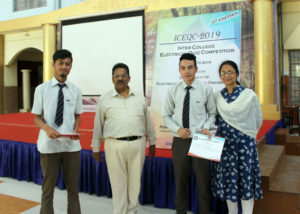 Team KIRCHHOFF comprising of Kangkan Bhuyan and Gaurav Deb from Girijananda Chowdhury Institute of Management and Technology, Guwahati- the winners of last year, defended their title by winning the coveted first prize. Team EDISON comprising of Rishav Saha Choudhury and Sikder Arif Mohammad from ADBU, and team HENRY comprising of Ariston Shabong and Jerrymeo P L Nongkynrih from ADBU bagged the second and third prizes respectively. All the winning teams were awarded cash prizes, mementos and certificates.